At least 11 people were sent to the hospital after more than 40 vehicles, including a school bus and a tractor trailer, were involved in a massive pileup on a snowy Maine interstate early Wednesday. Authorities shut down a 30-mile stretch of Interstate 95 in Maine on Wednesday when traffic came to a standstill after heavy snow complicated the morning rush hour near the town of Etna, ME and a crash caused a chain reaction at around 7:30 am, Stephen McCausland, a spokesperson for the state’s Department of Public Safety, told reporters. More than 25 vehicles were involved in the initial crash, McCausland told the Bangor Daily News, and other wrecks soon materialized on the stretch of the interstate leading up to the scene of the accident. “Some of those other crashes involved two or three vehicles each, and then other vehicles went off the road to avoid collisions,” he said in a statement given to the paper less than 2 1/2 hours after the incident began to unfold. 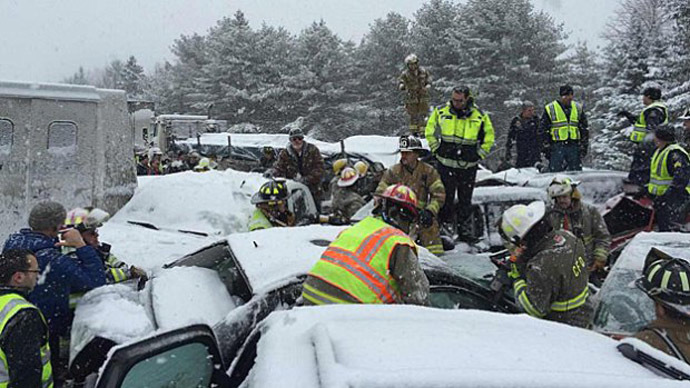 Matthew Theriault, a 24-year-old contractor who said he was among the first to stop behind the pileup, told the Daily News that other drivers were “going way too fast for conditions” when the crash occurred. Eastern Maine Medical Center in Bangor told the Associated Press that it had received 11 patients at its emergency department by 10 am in conditions ranging from good to fair, and McCausland said there have so far been no reports of fatalities. Police told the AP that two of the injured were thought to be in serious condition. “EMMC is providing appropriate care to all patients who have arrived at our Emergency Department, and we anticipate being able to meet the needs of any additional patients that may arrive,” the hospital told the Daily News on Wednesday morning. Nineteen students were on the school bus involved in the pileup, the paper reported, but no one onboard suffered anything beyond a minor injury. The National Weather Service expects affected parts of Maine to receive upwards of 9 inches of snow before Thursday.